3D printers “make” objects by building it layer by layer from the bottom up, in slices as thin as a millimeter across, based on its spatial product data in software format. Many intricately designed objects such as lamps, shoes, miniature architectural models and machine parts can be made this way. 3D printers have been around for three decades, but have only recently started becoming mainstream, due to lowered costs, ease of use and efficiency of usage. DIY tech enthusiasts have also made their own 3D printers. I saw one made up of lego that carves objects out of sponge. The speaker here argues that 3D printing technology is at a tipping point now, as more and more people are catching onto it. Mass production may not be necessary in future as consumers can download the product data of the product they want and manufacture it at home. They can even tweak the design to customize it to their own taste or needs. 3D printer technology will also lower the global carbon footprint, because products will no longer be needed to be transported by sea, land or air from the factories to the individual consumers. If what the speaker says is true, 3D printing is what is termed a “disruptive” technology, which will revolutionize manufacturing. New media artists have been using 3D printers to make rapid physical prototypes of objects or finished artworks. There are a few 3D printer shops in Singapore which offers this service. I think the printers they have use lasers to shape the objects out of wood or plastic based on the data you give them. 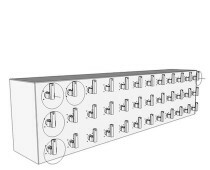 Google SketchUp can be used for designing and capturing the product data. I will be learning how to use a 3D printer later this semester and am looking forward to making my own 3D object.